This is a review of the Shoei Syncrotec Police Motor Officer motorcycle helmet. It is identical to the Syncrotec that you and I can purchase from any authorized Shoei retailer. But this helmet includes an interesting option: the M5 Switchblade Power System. It consists of a rechargeable lithium ion battery pack that is installed in either the neck roll or cheek pad of the LE (Law Enforcement) versions of the Syncrotec. Shoei makes other Police helmets: the Shoei RJ-Air LE , the Shoei ST-LE. There’s also an HJC version: the HJC AC-2 LE. The M5 Switchblade system powers a single LED light in the Syncrotec shown here, which is identical to the street version in all other respects. The M5 Switchblade costs $69.00 (not including the helmet, of course!). But the system can also power devices such as rider-to-rider communications, Bluetooth short range communications devices, heads-up displays, powered fan defogging units, helmet cooling fans and more. The battery is a 3.7 Volts DC, 650 milli-Amp hour lithium ion unit that weighs 1.3 oz. (40 grams). A.C.S.A.S. Technology Corporation, the developers of the technology, claim that the system will maintain its charge for up to 3 years without use and that it has a 35+ hour life between charges in the LED light application. 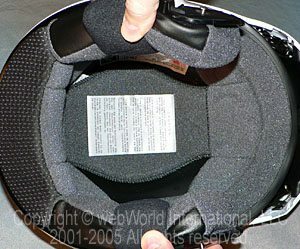 Since the system is part of the helmet’s cheek pad or neck roll, it can be switched in and out of similar sized helmets from the same manufacturer. The LED light in the Syncrotec turns on automatically when the flip-up visor is lifted. The light can also be disabled via a switch is hidden underneath the vinyl liner on the bottom of the neck roll on the right-hand side of the helmet (see photo). The purpose of the LED light system on a police motorcycle helmet is to allow the motor officer to use both hands during nighttime operations. But it is also the ultimate flashlight for use by motorcycling civilians for the same reason, and also because it’s completely unobtrusive and adds a minimal amount of weight to the helmet. The M5 Switchblade system comes with a 110 Volt recharger. The tiny recharging lead (see photo) is hidden underneath the helmet liner and can be plugged in to a matching lead on the recharger when necessary. Recharging time varies, averaging about 30 minutes. The M5 Switchblade system is available to Police departments through a special Police motorcycle helmet sales division of Helmet House, which is one of the largest distributors of motorcycle helmets and clothing in the U.S.A. The system is not currently available to the public, but our guess is that it would be if enough interest develops. A flip-up helmet like the Shoei Syncrotec is the perfect application for the LED light powered by the M5 Switchblade system, since the light can be switched to automatically turn on when the visor is lifted. The Syncrotec has been on the market for several years; rumor had it that it would be revised in 2005, but apparently this has been delayed. The Syncrotec has been part of the Shoei lineup for many years, and it remains one of the most popular flip-up helmets available. It doesn’t have any particular features that make it stand out from the crowd, but it’s a solid, well-built and serviceable helmet backed by the Shoei reputation. The Syncrotec Police motorcycle helmet version shown here is, as far as we know, the only flip-up sold for Police use, which is a good recommendation, because Police motorcycle helmets surely take a beating. Some police motorcycle departments will issue two helmets to their Motor Officers; a “shorty” like the Shoei RJ-ST LE or a half-helmet the Shoei RJ-Air in addition to a Syncrotec for use during inclement weather. The Syncrotec and the other Shoei and HJC Police motorcycle helmets are available in white, black or a black/white color combination. We haven’t tried a non-Police version of the Syncrotec, so we’re not sure if the M5 Switchblade system affects the internal head shape of the helmet or not. Our M5 Switchblade-equipped Syncrotec in size XL has an “oval” internal head shape, with a slightly tight fit on the sides. (For more information on choosing and fitting a motorcycle helmet, see the wBW Motorcycle Helmet FAQ page). The ear cups in the modified helmets are filled with a stiffer type of padding that also houses the M5 Switchblade power system. Since we haven’t tried a normal Syncrotec, we’re not sure how different the fit might be. But otherwise, the Syncrotec offers basic air flow through its smallish chin and brow vents. The flip-up visor is released via a single button latch underneath and in the middle of the chin bar. The button works backwards when compared to most other flip-ups; that is, it must be pushed towards the rider’s face to open. Normally, the rider’s thumb is used to hook the button and pull the visor forward. On the Syncrotec, the button must be pushed back towards the rider’s face with the index finger while grasping the bottom of the chin bar with the thumb. This makes for a slightly more clumsy method for opening. The Syncrotec has a solid feel when the flip-up visor is snapped shut, and it also has a strong detent at the uppermost position, which holds the flip-up visor in place. This is extremely important for Police use, because the last thing you’d want is to have the visor fall down while you’re investigating a suspicious character. Several other flip-up helmets that we’ve tried have very weak detents, allowing the visor to unexpectedly flip down over the rider’s face. 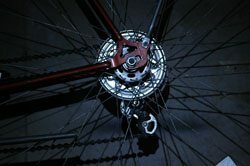 Our size XL Syncrotec with the M5 Switchblade power system installed weighs 3 lbs., 13 oz. (1731 grams), lighter than the Vega Summit XPV (review), the KBC FFR (review) or the SCHUBERTH C2 (review) flip-up helmets and lighter even than a couple of full-face helmets we’ve reviewed. See the wBW Motorcycle Helmet Weights page for a chart illustrating the weights of the various helmets we’ve reviewed. The Syncrotec doesn’t break any new ground in this area, but the tightness of the helmet due to the M5 Switchblade system seems to help keep apparent noise levels lower than they would be otherwise. The oval internal shape of the helmet also means that the neck roll is tighter than some other helmets, and this also helps to decrease ambient noise levels. The “booming” noises that are usually the most annoying are typically a result of turbulence caused by “dirty” air coming off the motorcycle windscreen, and these noises are often heard from up underneath the helmet, especially if the neck roll does not fit snugly. The Syncrotec uses a standard D-ring attachment system, which is the simplest and best type of motorcycle helmet attachment method in our opinion. 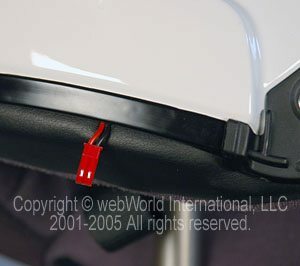 The loose end of the helmet strap has the typical Shoei plastic snap which attaches to the crossbar on one of the D-rings, keeping the loose strap from flapping in the breeze. The helmet has two small and narrow lengths of padding to protect the rider’s neck from chafing. 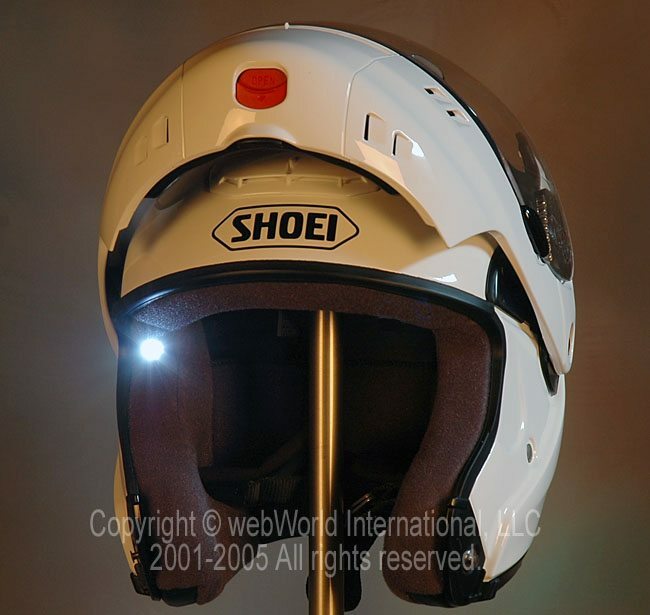 The M5 Switchblade, LED-equipped Police motorcycle helmet version of the Shoei Syncrotec uses a single LED embedded in the upper right hand corner of the cheek pad. 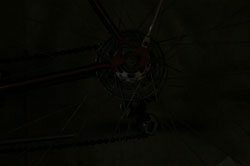 The light in our helmet throws out a nice, round pattern that’s useful for a number of purposes. A single LED throws a surprising amount of light, and although the LED in our helmet certainly isn’t a replacement for something like the Gerber Reactor LED flashlight, it’s powerful enough to read a driver’s license during a stop. Or, it’s good enough for packing a tank bag, filling out paperwork or even performing some roadside maintenance. See the wBW Flashlight Reviews for more information on flashlights, LED flashlights and flashlight reviews. Shoei Syncrotec Police Helmet with no light (L) and LED on (R). The M5 Switchblade power system is one of those “why didn’t I think of that” ideas that has the potential of creating a variety of new products for motorcycle helmets. Other uses for the M5 Switchblade power system are already in use, such as the powered venting system on the AFX FX-11 Lightforce helmet (review). A.C.S.A.S. Technology Corporation, the developers and manufacturers of the M5 Switchblade system, told us that they are currently working on a seamless helmet-to-helmet communication system “which is a generation beyond Bluetooth”. It will come standard on a new line of helmets they’re launching in 2006. I.H.T. helmets is also developing a photochromic visor (review), LED lighting, and wireless communication system. Plans are for the helmet to retail at around $350-$400. They have contracted with Mike Lavellee of Killer Paint to design the graphics; Mike is world renowned for his True Flames and is a regular on TLC’s Overhauling, Rides, and the Discovery channel. Manufacturer: Helmet House Police Helmets List Price (2006): M5 Switchblade MSRP is $69.00. Shoei Syncrotec helmet list price is $475.99 (solid color). Colors: White, Black and Black/White. Made In: Helmet: Japan. M5 Switchblade: U.S.A.